The other day I came across a play called The Black Crook, by Charles M. Barras. 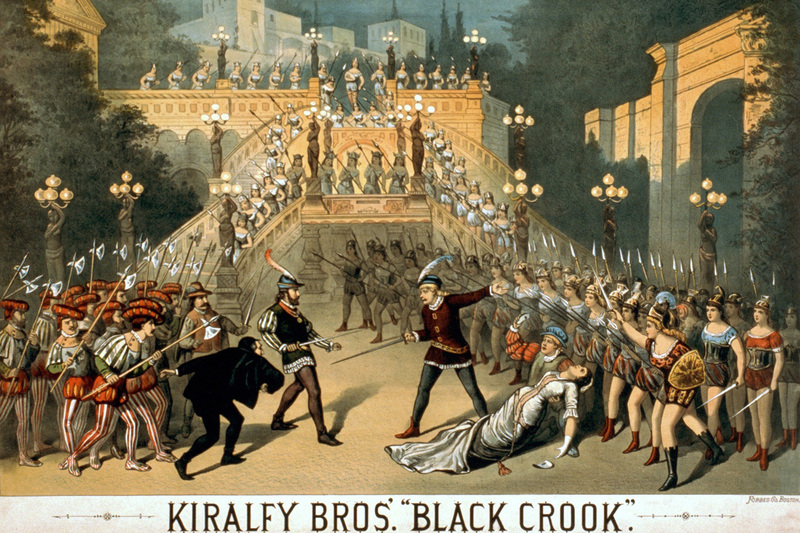 As it turns out, The Black Crook is considered to be the first modern American musical comedy. And where do you think it was first performed? On Broadway in New York, of course! The show opened on September 12, 1866 in a theatre called Niblo’s. The theatre’s manager, a man named William Wheatley, had just bought the rights to The Black Crook, but when he read the script, he found it to be rather dull. The melodrama had a confusing plotline and nothing in it to make it stand out amongst other plays in the 19th century. He sought out performers with new and interesting talents to add to the stage, but came up short. Wheatley was at a loss of what to do until a miracle in disguise occurred. The New York Academy of Music had recently burned down, leaving a troupe of French ballerinas without a theatre in which to perform. Wheatley immediately offered them a job in The Black Crook, and they accepted. When the play’s script writer heard of Wheatley’s grand idea, he was infuriated. He refused to have 100 scantily clad women prancing about the stage in his show. It would be a scandal! After Barras was paid more than $1,000, he quickly shut his mouth. The performance had four acts in it, and lasted a total of five hours (people’s backsides must have been really sore!). But they didn’t complain. The musical, regardless of its bad actors and cheesy dialogue, was a hit among the public. Wheatley had turned the once flat comedy into an extravaganza that combined singing with both burlesque and ballet. The show had a spectacular transformation scene in it, where a rocky cave would turn into a fairyland throne room—right before the audience’s eyes. 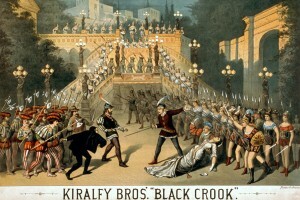 The Black Crook’s special effects really paid off— the show ran for 474 performances, and grossed over one million dollars.